Do you need a space in your own home where you can exercise, burning calories and building muscle? You need the best barbell for the job. The best barbell for home gyms will help you switch up your routine, and get that dream body. To help you find the best barbell on the market, we researched a variety of new and bestselling products. The result is the top ten barbell reviews below. Now: Here’s what you need to know when shopping. Length: The first category is straightforward. 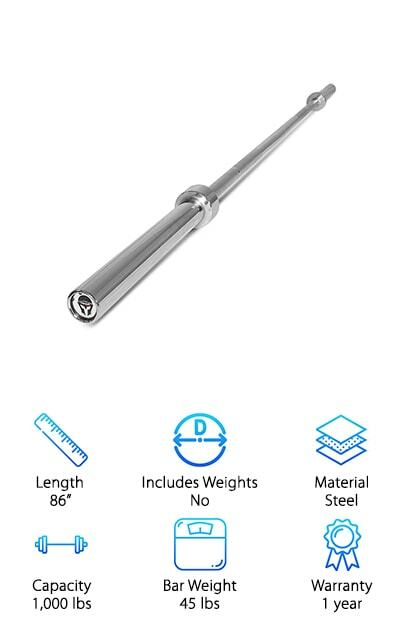 By telling you the length of each barbell we chose (in inches), you will be able to see how much weight it can carry, and if it suits your needs for a workout. Includes Weights: Some of the barbells we chose include a variety of weight options, which are a great asset. We will mark this column, and then we will go into further detail on the weights provided in the item description. 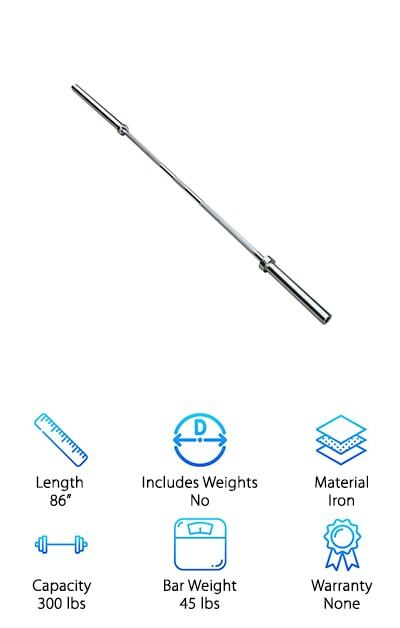 Material: Steel and iron are two of the most common choices for barbell construction, while there are other textured barbells with plastic or chrome covering. Everyone has a favorite type of material for lifting, so we’ll detail that here. Capacity: How much can your favorite barbell handle? This category will help you see how many pounds it is designed to take on, which will make it possible for you to decide if it makes sense for your workout. Bar Weight: The bar itself can be light or on the heavier side, and it can often be used for workout moves on its own. Since bars without weights are included in many home workouts, we’ll let you know what it weighs. Warranty: If the idea of investing in a home gym is an exciting one, you probably want to know about warranties as well. Never fear! We researched that information, too. Check this category to find out how long the warranty lasts. 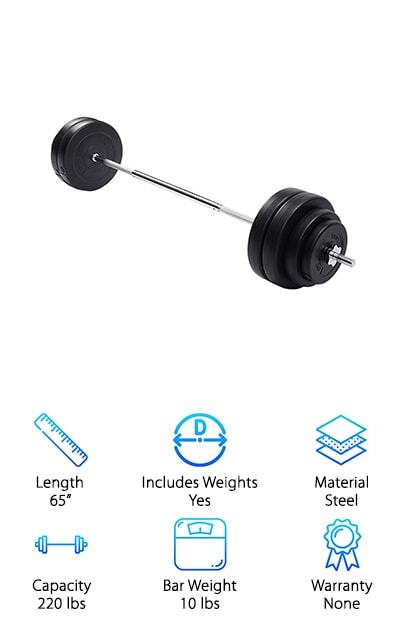 Now that you know how to find an awesome barbell for working out at home, it’s time to get to the reviews. Here’s the deal: If you’re in a hurry, take a look at the top pick and the budget pick. Both are excellent products, and they’re among the best we found. Right below are the 8 runner-ups. If you’re looking for the best Olympic barbell, it’s on this list. So is the best CrossFit barbell. Let’s get started! Are you ready to pump some iron? You can do that in the comfort of your own home or garage with our top pick, the Troy USA Sports Olympic Weight Set. This is a complete set, and it comes out of the box ready for you to begin your reverse barbell curl routine, your deadlifts or your clean and presses. A total body workout is completely achievable with this bar and the included accessories. Here's what you get: One bar, made from cast iron, with a grey enamel finish. It weighs 45 pounds. Then there are 14 USA Olympic weight plates. Two weigh 45 pounds, two weigh 35 pounds, 25 pounds, 10 pounds, 5 pounds and 2.5 pounds respectively. The 2.5-pound plates make it easy to adjust any exercise by just five pounds. There are also two collars with spring settings to hold the plates tightly in place. Troy Barbell offers a limited 5-year warranty on this awesome set. A full workout kit is waiting for you with our budget pick. The US Weight Barbell Weight Set isn’t just a barbell. It’s a barbell, dumbbells, AND weights. That means you can do both one-handed and two-handed lifts and moves. The possibilities are endless. What are we talking about? One 55-inch barbell, weighing 4 pounds. Then there are the dumbbells, and 6 locking spring clips so that you can set up all three bars as you get ready to work out. The weights range from 5 pounds to 20 pounds, totaling 100 pounds in weight. Just imagine: You can set up weights for snatches, deadlifts, barbell reverse curl exercises and more all at the same time. In addition to being helpful, it’s really efficient. The barbell is also made with a textured, non slip grip area for solid grabs. Both beginners and pros will find something to love about this set. It is resistant to rust and easy to set up. One of the truly great things about a barbell workout is that every single person who tries it can benefit from it. It is approachable for people of all strengths, even those who are learning about weightlifting for the first time. You also don’t need an expert to learn many barbell exercises within an hour or two. With the CAP Barbell Curl Bar, learning is even easier, because this isn’t a perfectly straight rod. It actually has a couple of curves in the center where you place your hands, which assist with placement and posture as you work. 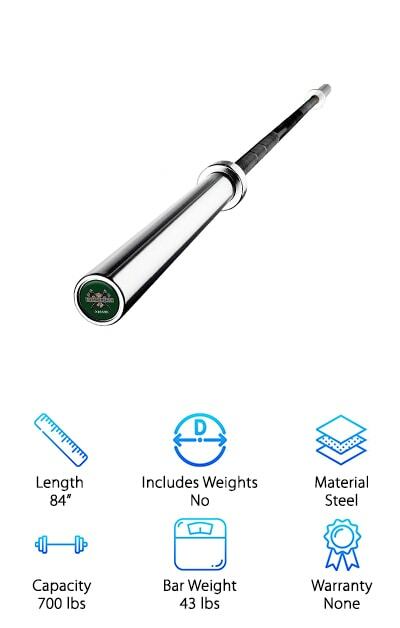 The CAP Barbell bar measures 47 inches long and is made from solid chromed steel. The ends are threaded, to help hold the included collars. The caps have rubber O-rings, and the barbell has O-ring inserts, so the collars will fit nice and tight. Any weight plate with a 1-inch hole will fit onto this bar. Turn yourself into a fitness buff! If you like working out at home, and you’re wondering if purchasing a barbell is worth it, listen up. The barbell is deceptively simple. But with it, you can reach dozens of different training goals. The sky is also the limit as far as resistance is concerned. That's especially true with the Body Solid Olympic Bar. It is professional-grade, and it will support up to a whopping 600 pounds of weight. It is 7 feet long, with knurled ends for grip. The bar itself is enough to complete a workout since it weighs 44 pounds on its own. The Olympic Bar is similar to the bars you will see in any gym setting. This is an investment that will show quick results when you add it to your daily routine. Bench pressing, back-squatting, do everything you need for a complete body exercise regime in your own private space. Body-Solid backs up its products with a lifetime warranty. In the world of sports and body conditioning, a new gadget is a focus every week. Eventually, though, they fade away and are replaced by something different. There are tools, however, that have been popular and heavily utilized for decades, and nothing is more familiar or more recognized than the barbell. 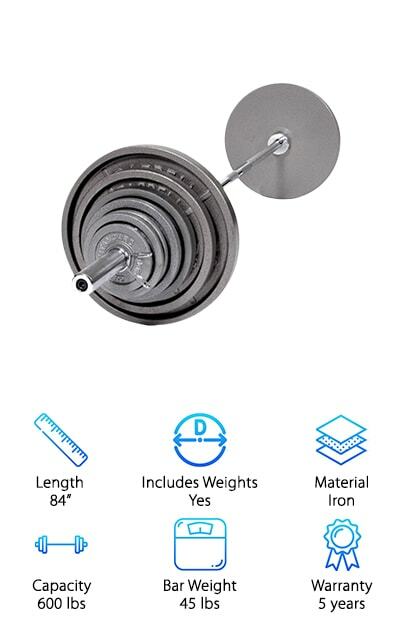 If you need a barbell set for your own home, you have to consider the USA Sports Weight Set. This set is exactly what any pro athlete or beginner needs in their life. 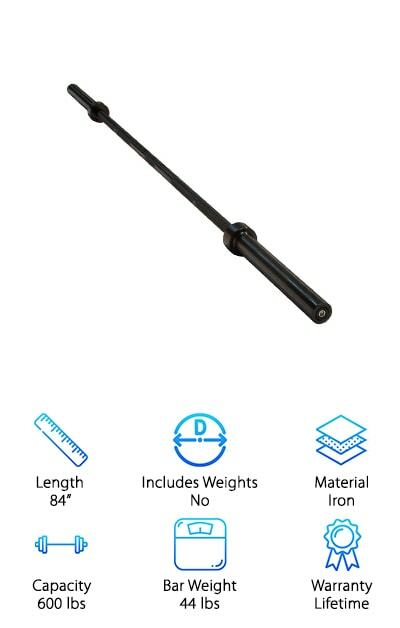 You will get a 7-foot barbell made from solid cast iron, coated with a black satin enamel finish. It is precision milled so that the dimensions are exact every time. It also comes with weights. You get 14 USA Sports Olympic plates: 2 x 45 lbs., 2 x 35 lbs., 2 x 25 lbs., 2 x 10 lbs., 4 x 5 lbs., and 2 x 2.5 lbs. That is a total of 300 pounds of weight. 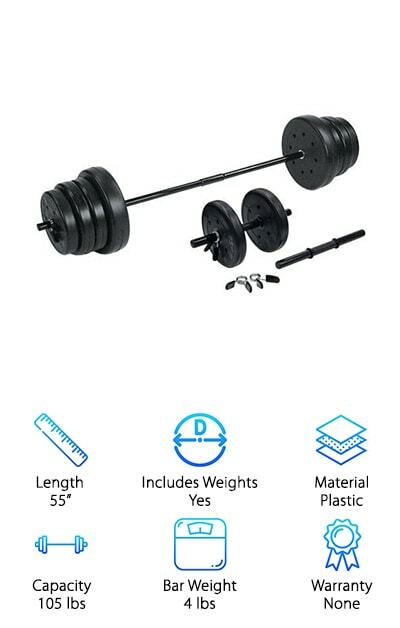 Anyone considering adding on a barbell or introducing weighted exercises to their routine should consider the functionality and affordability of this set! Here’s the scoop: The Giantex Weight set is one of the most economical purchases you can make, and still receive quality workout equipment. The set comes with everything you need, beginning with the bar itself, which is made from steel. Then there are 2 buckles to hold the weights, and the weight plates themselves. The largest 4 plates weigh 22 pounds each. There are also 2 11-pound plates, and 2 4.4-pound plates. Everything you need is there as you focus on increasing muscle and building stamina. The plates are made from a sturdy propene polymer. The bar can hold up to 220 pounds in total. You will have virtually all you need to create a successful home gym where you can set goals for yourself and hold yourself accountable. Try out the Giantex Weight Set today! Are you looking for a bar that is virtually identical to any bar you’ve seen at your local gym? There are products out there that are equal in quality and construction, so you can carry your own workouts on your own time at home. This is one of them: The Yaheetech Olympic Weight Bar. It’s got “Olympic” in the name because it weighs 45 pounds, which is also the standard bar weight used by Olympic weightlifters. It is also virtually identical to the bars you find in professional weightlifting settings. So, with the Yaheetech bar in hand, you can put yourself through the paces of an “official” workout and gain some serious strength! The bar, in addition to being a solid weight, is also made from iron. It is coated with an anti-rust silver finish. That is going to stay on and keep your bar looking attractive, even as it gets tossed around. This bar will fit any 2-inch plates. If you’re looking for a really well-made barbell, but a 45-pounder is just too much for you, we've got the answer. The RAGE Fitness Barbell weighs just under 15 pounds, and it is the perfect piece of training equipment because just about anyone can handle it. This is an aluminum barbell, ready for use to master the basics of Crossfit, weightlifting, and power lifting. It is ideal for both a home or a class setting. There are durable, rotating sleeves with bushings, and both the grips on the ends and the center has medium knurling. The bar is 6 feet long and can accommodate Olympic plates with a 2-inch hole. You can load up to 300 pounds on this baby, so don’t think of it as a lightweight. 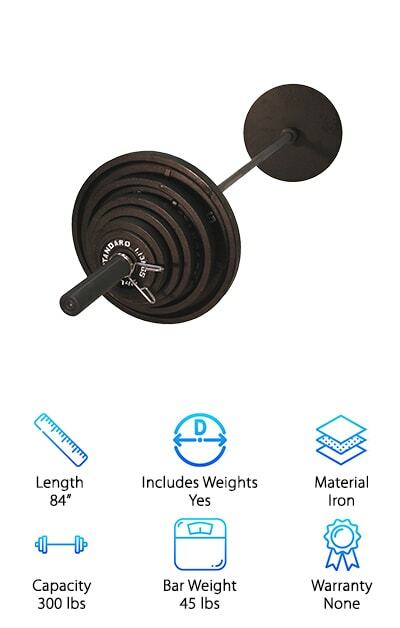 At this price, it is an appropriate gift for anyone who wants to take up lifting and doesn’t know where to start. Give them the RAGE Barbell and watch as the gains begin! Everyone has a fitness goal. For some, they’re looking to bulk up and build layers of muscle in key groups. Others want to tone and firm their bodies. Then there are weightlifters, who want to be incredibly strong and do both. The XMark Fitness Barbell can help you reach every single one of those goals. It is as good, or better, than what you'll find the pros using in corporate training settings. Here's what you get: This barbell weighs 43 pounds, and it can carry up to 700 pounds without any deformities. That means it's good enough even for Olympic powerlifters. The bar is made of steel, with a unique black manganese phosphate shaft. That is one of the hardest coating substances available. It will work to prevent corrosion and abrasions. Brass bushings provide the perfect spin. There are IWF and IPF knurling marks, made at medium depth. Make an investment in the XMark Lumberjack bar – you won’t regret it! The Titan Fitness Barbell is another phenomenal item which can go up against any bar you’d find in a professional gym or Crossfit facility. If you need to work on your clean and jerks, if your deadlifts are weak or you need to improve your bicep curls, take a look. The first factor that makes it comparable to gym bars is its construction. It is made from pure steel, and it is delivered in one piece, ready to go. There is a silver chrome finish both to improve the look of the bar and to prevent rusting as it sits in your garage. It weighs 45 pounds, and it can easily support up to 1,000 pounds of weight. That is one of the highest weight capacities of any bar on our top ten list! All Olympic-sized plates with 2-inch holes will fit on this bar. The bar’s grip has a knurled handle to prevent slippage. Slap on your gloves and get started!